Wheat and sheep farming and the manufacture of agricultural equipment are the main industries of Kellerberrin located in the centre of the Wheatbelt region. 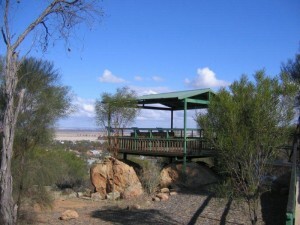 A drive to Kellerberrin Hill provides panoramic views of the town and surrounding region. A special treat is spring as the hill supports a mass of native wildflowers. The heritage walk trail takes you through town past charming historic buildings, churches and the museum. Centenary park provides a children’s playground, pergolas and BBQ facilities. Town services include cafes, butcher shop, supermarket and hotel. Kellerberrin is at the heart of many natural attractions including Mt Stirling and Mt Caroline 25kms south, offering magnificent views of these giant granite outcrops. Artwork by local artist Sean Conway. A range of arts and crafts.